10mm tunnels - for many people just the perfect tunnel size. 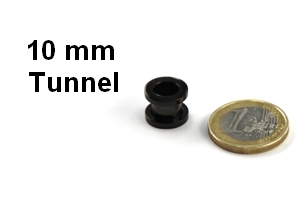 Our experience shows that tunnels and plugs between 6mm and 12mm 12mm are the most common tunnel sizes. Especially girls prefer the 10mm flesh tunnels. The size it not too small but also not too big so that it still looks very feminine. But as often it is a manner of taste. Smaller tunnels look more elegant in women´s ear lobes. Men instead often prefer larger flesh tunnels. The weight is still no problem in this tunnel size. Even flesh tunnels made of steel are very lightweight in 10mm.